It's hard to tweet, blog and follow Facebook when you are really focused on writing a book. The challenge is to keep all the characters in your head and on your outline plot/cards however you may do it as you get to those moments when they take on a life of their own. Tracking consistency but avoiding predictability is the challenge. I have two completed books but they now need covers and I want to step these up a notch. Clearly, the Kindle listings do weird things to formatting and cover graphics. 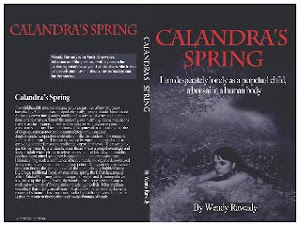 My pictures for 'Calandra's Spring' looked awesome. My designer is very good. But when reduced by Kindle's system, the font was not good. And I left in a phantom 'by' in there. Check it out, see what you think and all you pros out there, your comments and feedback are very welcome!